Villa on Lake Maggiore, Arona, Oleggio Castello. Pool, Garden, lots of fun. La Reggia is nestled on top of a hill with stunning 360 degrees views of Lake Maggiore and Monte Rosa, one of Italy permanent glaciers. It features a wide private garden, with plenty of space, trees and flowers, quiet and relaxing environment, a pool with its own facilities and space for up to ten adult guests. 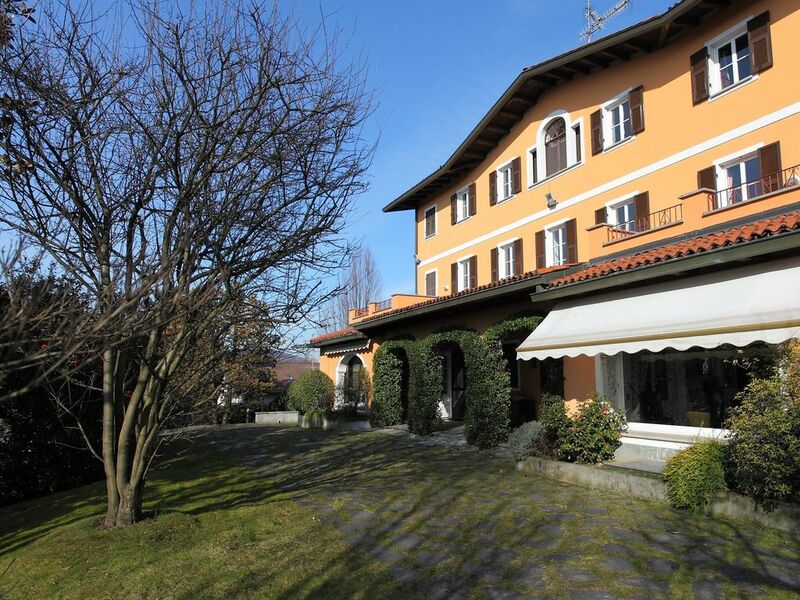 Located only 5 minutes away from well known town of Arona and 20km from famous Stresa, it is easy reachable from the international airport of Milan Malpensa, and less then one hour drive from Milan city center. My wife Monica was born and raised in Oleggio Castello, and that is why we chose this area as the right place to build our Villa in the Country side. Where we can celebrate events, Christmas gatherings with the bigger family, and also parties and reunions with friends of a lifetime. This property was passed down through generations. It was only in 1988 that it was decided to took over what was left in ruin for decades and restore this Villa to be the family country house. it took 6 years for works to be completed and for the family to have the first gathering in 1994.
the geographical position is very convenient for Lake activities, sightseeing, shopping, skiing, golfing and variety of other sports, or just for full relaxation in the garden or the private pool with good book or good company. Oleggio Castello is a small livable village nestled in between the mountains and the Lake, perfectly in the middle. From most of the Villa's rooms, guests will have clear, undisturbed view of Lake Maggiore and the lake complex towards the East. Castello di Oleggio Castello (the Castle of Oleggio Castello) can be seen on the North side, and is accessible by walk only 750 meters from the Villa. Stunning views of Monte Rosa on the West, part of Monterosa SKI, one of Italy's permanent glaciers. independent hot water and heating system is available in the house with multiple area of settings per floor per room. 2 fireplace are available in main living room, and one in the basement, with the possibility to use it for cooking. 6 cars can fit within the Villa premises in the parking space. to park up to 6 cars. with scooter and bicycles available. the fireplace in basement is suitable for cooking. big refrigerator in the kitchen and additional refrigerator in the basement, for drinks or food. freezers also available. gas stove in the kitchen is suitable to cook for many. all items are available for use. everything is available for use, for up to 20 people. in the dining room the table is extendable to sit up to 16-18 people. one child highchair is available. available in the living room, basement and in some bedrooms. few rooms have access to different balconies on the sides of the villa. a portable outdoor barbecue is available to be placed in any corner of the garden. at the pool a barbecue is available, pizza oven and hot stone cooking. the pool is nestled in the garden of the villa, facing south-west, exposed to sun till late evening in summer. with its own deck, deckchair, changing room, bathroom, shower, kitchen, dishwashers. Arona Ferry Terminal has daily connection to other lake destinations, both on the Italian and Swisse side (Ascona and Locarno). Timetable is available on the below link. Milan City is only 45min away by Train from Arona station to Milan Central station. Or only 45 minutes by car from the Villa to the City. Milan Malpensa airport is easy accessible by car or taxi in 30-40 minutes from the Villa. Stresa on Lake Maggiore is one of the oldest town around the lake with plenty of attractions. Firstly the lure of its Grand Hotels of the past, then the wonderful islands just 5min of boat in front, 'Isola Madre' with its botanical garden, 'Isola Bella' and 'Isola dei Pescatori'. Back on mainland, Villa Ducale, Villa Dell'Orto, and the biggest Villa Pallavicino, now the site of a garden and zoological park are not to e missed. Lake Orta with its icon "Isola San Giulio", is a popular destination for small-scale tourism. famous also for the Sacro Monte site of pilgrimage inserted into the World Heritage List. Mottarone, is the closest place where to SKI in the right season, although a bit small complex it is good for daily trip. same for Macugnaga. Alagna Valsesia, only 80km from the Villa, connects you to the biggest Monterosa SKI complex. A bit further away, approx 200km, you can Ski at the "Via Lattea" Complex, which includes Sestrieres, Salice D'oulx, Sansicario.